Eric De Los Santos, Associate General Counsel and Senior Director of Employment Law, TrueBlue Inc.
Today, both as associate general counsel and chair of the Diversity and Inclusion Council at staffing company TrueBlue and through work with a range of outside organizations, he employs a number of tactics to help himself and others keep diversity at the forefront of their minds. 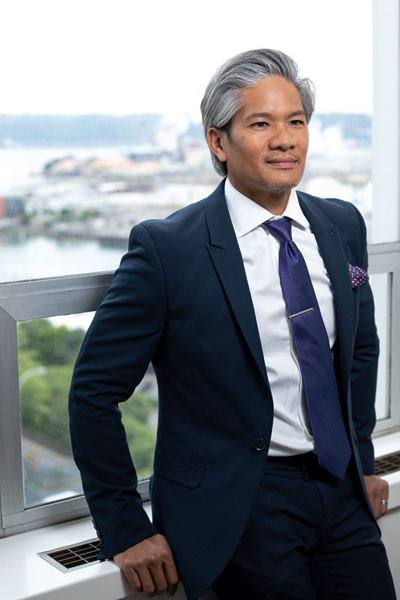 De Los Santos has been passionate about D&I since growing up in Hawaii as the child of Filipino immigrants. He learned from an early age that diversity makes the world a richer, more colorful place. And, as a gay man studying on scholarship at Brown University—where he cofounded the Filipino Student’s Alliance—he recognized the importance of confronting issues of bias. He tackled such issues many times over the course of his seven years as a trial attorney, trying cases on subjects ranging from disability discrimination to sexual harassment. But, when he joined TrueBlue—then named Labor Ready—as corporate counsel in 2004, he found opportunities to create conversations in new ways. This started after an early company outing he attended with his partner and now husband, when people later came up to him to congratulate him for introducing their relationship. “They’d never seen someone come out that way,” De Los Santos says. After realizing there was an interest and willingness in the workforce to engage with D&I matters, he frequently worked to start conversations around that topic. So, when an HR vice president started the Diversity and Inclusion Council in 2012, De Los Santos was a natural fit to later take over the chair position. And, from the outset, he was committed to making sure that the council would have a lasting foundation. “We recognized that it was important to have everybody engaged, that diversity isn’t just what’s on the outside; it’s also everything that makes us who we are,” De Los Santos says. The council’s efforts were overwhelmingly popular. People were excited to have these new conversations and opportunities to build trust. So, De Los Santos’s next challenge was to keep that momentum going. “The question became, ‘Now that we’ve got everybody excited about D&I, how do we move this forward and make an impact?’” he says. From there, he worked to create a comprehensive program. This included starting employee resource groups, including Women in Leadership, the African-American Resource Network, and an LGBTQ group called BE PROUD, which will soon be joined by groups for Latinx and Hispanic employees and veterans. The council has also been pursuing initiatives and programs to engage TrueBlue’s temporary workforce, and it has worked to classify ways to build and clarify its program foundations and create a pipeline of future leaders. Lately, De Los Santos has been working on several new initiatives: One is a second-chances intitiative, to help people who have previously been incarcerated, and another is an awareness campaign called Origins, with exercises where people talk about their ancestry and have opportunities to learn their heritage through DNA kits. He and the council have also been focused on developing partnerships within local communities to help grow their business services. In the past few years, they have also participated in various LGBTQ events, including the Seattle Pride Parade. This has all been a second full-time job for De Los Santos. Having taken over as chair in the midst of his promotion to his current role, he has been equally focused on directing TrueBlue’s employment law division, where he’s dedicated to making sure that discrimination issues are handled appropriately. But, he’s been thrilled to do so, and to do so at a company that supports D&I.